Well…I’m impressed. The bills are in for the Old Vic utilities through last week. 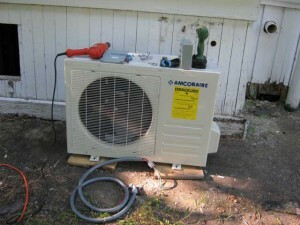 Y’all may remember that last summer we installed our first ductless mini-split unit…a SEER 20, 12,000 btu heat pump. The new super efficient unit is in the kitchen and heats/cools a similar area as the other living area, which is heated by a modern space heater and cooled by a 12,000 btu window unit. It was easy to compare cooling costs…as I can directly measure the current pulled. Heat was more difficult…comparing electricity use to natural gas use for heat is a challenge. It is doable with all kinds of math but outside temperature matters (heat pumps get less efficient as the temperature drops) so I decided simply to run the two rooms the same and just see what happened with the bills. So, we knew on the cooling…the new unit uses 1/3 the power, AND makes the room much more comfortable as it removes more humidity and stirs the air around. It is also MUCH quieter than a window unit. Now, to heat. The bills are in…and again, it costs 1/3 as much to heat with the heat pump as it does with natural gas. It also is more comfortable…it runs the fan slow to keep the air stirred around. With 12′ ceilings the heat tends to go UP, and this unit, being mounted high, takes care of that, circulating the heat back down into the living space. There are no cold drafts like most folks complain about heat pumps. Soooo…real world testing…this thing costs 1/3 as much to run as other methods for both heating AND cooling, AND keeps the area much more comfortable. I was skeptical. Not now. This thing will pay for itself in energy savings in 12 months. We will be installing more of these. This entry was posted in Heat/Air Conditioning, Kitchen. Bookmark the permalink.